I owe you a potato salad recipe! I really meant to get this recipe posted last week, but I didn’t manage to get it written before leaving for a long weekend in Virginia (if you’re ever in Williamsburg, try The Trellis) and then this past week turned out to be unexpectedly busy! But I haven’t forgotten about the potato salad I promised you on Twitter! As I detest mayonnaise, I decided to make a yogurt-based potato salad. Plain Greek yogurt provides both a wonderful creamy texture and a nice tang, which I amped up even more by adding some soft goat cheese and a little dijon mustard. (Emphasis on little. I’m not a fan of mustard but my husband loves it so we compromise). As I was chopping up the potatoes I remembered that I also had a lonely ear of corn in the back of the fridge. So in that went as well! All in all it turned out to be quite good, both as an entree and as a side dish. (And as a way to clean out my fridge!) 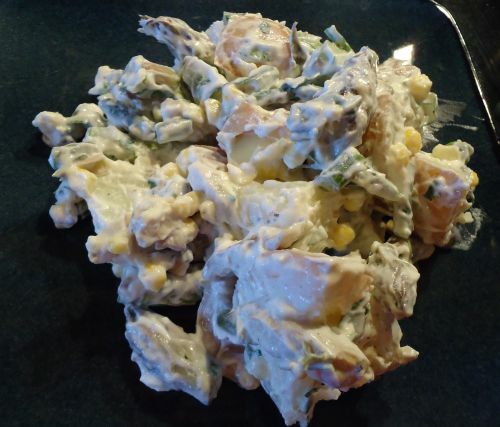 So the next time you have some potatoes and other random vegetables hanging around, make yourself some potato salad! Put your potatoes into a large pot of salted water and bring to a boil. Reduce the heat slightly and let them cook until the potatoes are tender, but not falling apart. (You don’t want potato mush in your potato salad!) 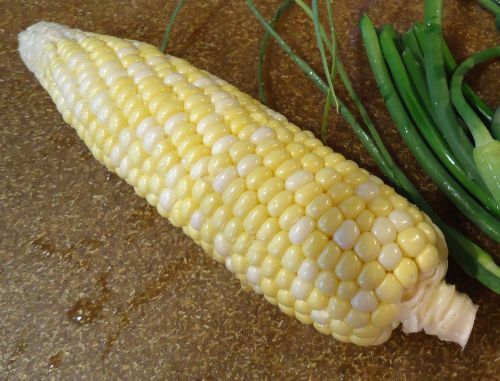 While the potatoes are boiling, drop your shucked ear(s) of corn into the water for about a minute or so. Pull the corn out with a pair of tongs, run some cold water over it to stop the cooking, and then set it aside to let it cool the rest of the way. When the potatoes are done, drain them, and set them aside to cool. Meanwhile, get out a medium sized skillet and heat it over medium heat. 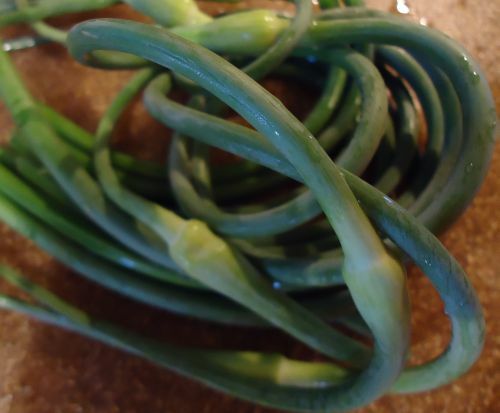 Add a splash of olive oil and then toss in your mushrooms and garlic scapes. Saute for a few minutes until the mushrooms are browned, then remove the skillet from the heat and let the mushrooms and garlic scapes cool as well. While you’re waiting for everything to cool, in a small bowl, whisk together the Greek yogurt, goat cheese, vinegar, mustard, and pepper. Taste it as you go, and adjust the ingredients to your preferences. Set aside. Get out a large bowl, and stand your ear(s) of corn on end and shave off the kernels into the bowl. Then chop the asparagus into inch-long segments and add it to the bowl as well. Add your cooled potatoes as well as your mushrooms and garlic scapes, and then add the yogurt mixture. With a spatula or wooden spoon, gently fold everything together until all of the components are well-coated with the yogurt mixture. Season with salt and more pepper to taste and enjoy! I made this recipe back at the beginning of January, but only now have I finally found the time to post it. It’s a good, hearty bean soup, spicy but not overwhelming, and good for warming up on a cold winter’s day. Y’know, if it’s still winter where you are. It’s certainly not here! For vegetables, I used onion, carrots and parsnips, which were what I had laying around in the bottom of the fridge. You could certainly use other vegetables as well, such as celery or fennel…sweet potatoes would also go well with the spices in the soup–just dice them up into 1-inch chunks and add them at the same time as the beans. The strongly flavored spices in this soup contrast well with the relatively neutral flavors of the beans and lentils, as well as the sweetness brought by the carrots and parsnips. But if you’re missing one or two of the spices, don’t worry–just use what you have. And you can always adjust the flavors at the end. But just to warn you, the cayenne pepper does give the soup a bit of a kick, so if you don’t like spicy food, just leave it out. Soak your bean mix in cold water for several hours before you intend to start cooking (or overnight). Drain and rinse. Put a large stock pot on the stove over medium heat. Peel and dice the parsnips, carrots, and onion, and when the pot is hot, pour in a good glug of olive oil and add the vegetables. Let them cook for a bit, stirring occasionally, until the onion starts to go translucent. Then add the wine and bay leaf, and continue to cook until most of the wine has cooked off. Now add your spice mix. After stirring it in, add your drained and rinsed bean mix, and enough water or stock to cover everything by an inch or so. 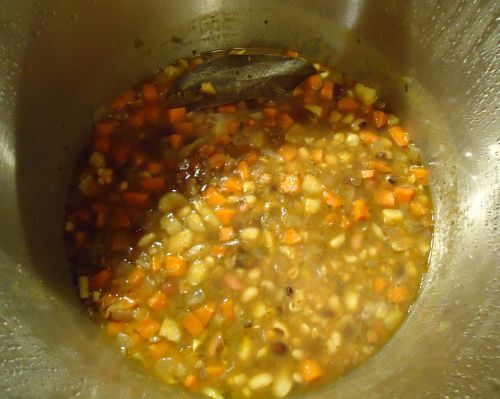 Bring the soup to a boil, then reduce the heat and let it simmer until the beans are cooked through and tender. This will take about an hour, depending on how soft you want the beans. 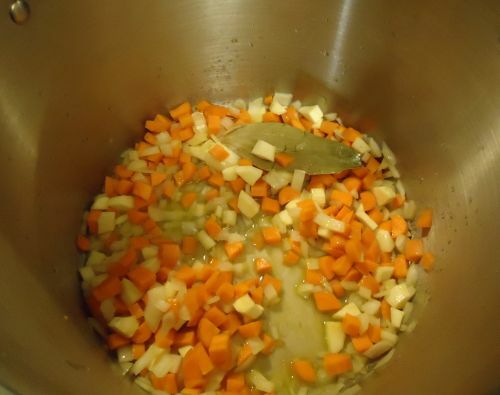 Check the soup periodically while it’s simmering, and if it seems like a lot of the liquid has boiled off, add a bit more water. When the beans are cooked through, taste the soup and add salt as necessary. If you want it spicier, feel free to add another dash of cayenne pepper. Serve as is, or topped with a dollop of sour cream. Enjoy! 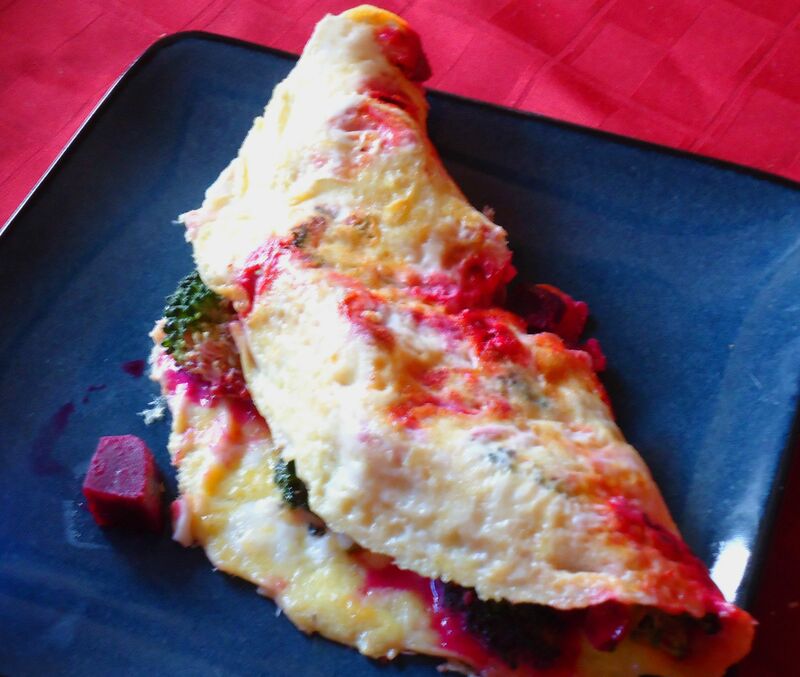 This was my lunch yesterday–omelettes are my favorite way to use up leftover veggies! Also, beets are curiously good in omelettes. Not sure why I’d never tried that before. 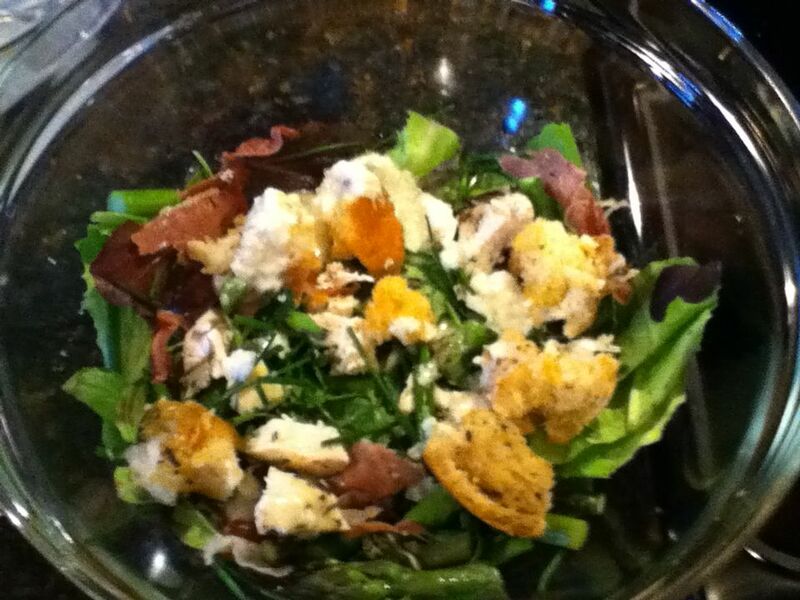 I’ve got such a backlog of posts for you, from some thoughts on Jamie Oliver’s Chicken Caesar Salad (it’s delicious!) 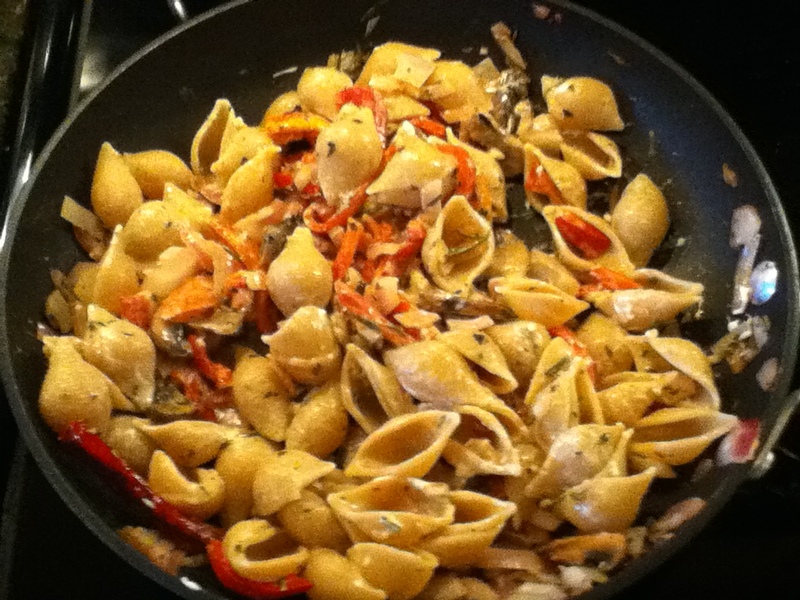 to a quite tasty red pepper pasta dish I made up the other night, so let’s dive right in! Let me start by saying that I don’t like Caesar salad. But this was delicious! The homemade croutons are easily the best part, but everything just works so well together, and the dressing is lemony and fresh as opposed to being heavy and gross like most salad dressings. I did make a few changes (mostly out of necessity) when I made it though. First, instead of using chicken legs or thighs, I had to use chicken breast because I couldn’t find any legs that weren’t attached to a whole chicken. (And as the only carnivore in the house, I really have no use for a whole chicken). But legs would definitely be better because they don’t dry out the way breasts are sometimes prone to. I substituted prosciutto for the pancetta that the recipe calls for since I can’t for the life of me find a store that sells pancetta, but the prosciutto worked fine and added a nice salty flavor. I also added asparagus (just tossed it in with the chicken and croutons when I added the prosciutto) and I think that you should all definitely add asparagus if you happen to be making this salad in the springtime! This meal came out of one of those “I’m starving but I don’t want to go to the store and surely we have enough food around here to throw together a pasta dish” type of days. And sure enough, we did have enough ingredients and this actually turned out to be one of my best experiments. The inspiration was the jar of red and yellow peppers I found in my cupboard. I don’t remember why I bought them in the first place–probably I had seen some recipe that I had wanted to try but subsequently forgot about–but they really turned out to be the star of the dish. I also had a few stray mushrooms left over from the pea shoot recipe, half a red onion left over from something or another, two lonely cloves of garlic, and a bit of fresh rosemary left over from the chicken Caesar salad. So of course, these ingredients say to me: stir fry! The roasted red peppers from the jar add a really nice sweetness to this dish, while the dried red chili adds just a hint of a kick. Top it off with a little Parmesan cheese and you’ve got yourself a quick and easy meal! Start a pot of water boiling on the stove for the pasta. Meanwhile, chop all of your ingredients except the red chili pepper. 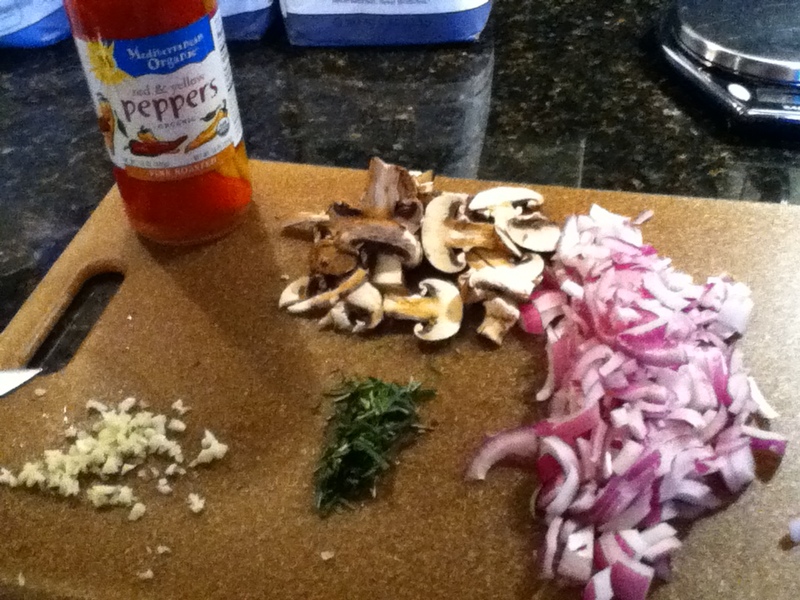 Put a good splash of olive oil in a skillet over medium heat and add the mushrooms, onion, chili pepper, and rosemary. Stir or toss occasionally until the mushrooms start to brown. 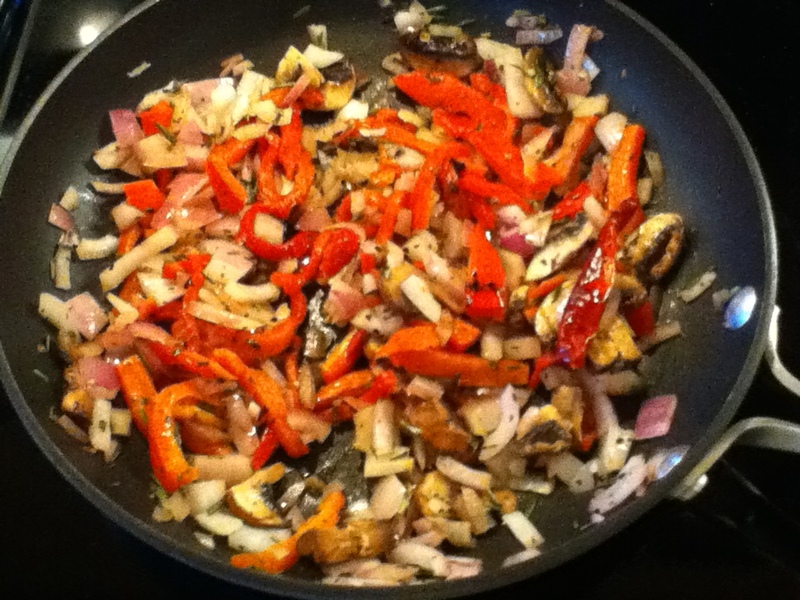 Then add in the red peppers and garlic, taste, and add salt and pepper as needed. Once the pasta is done, drain it and it to the skillet. 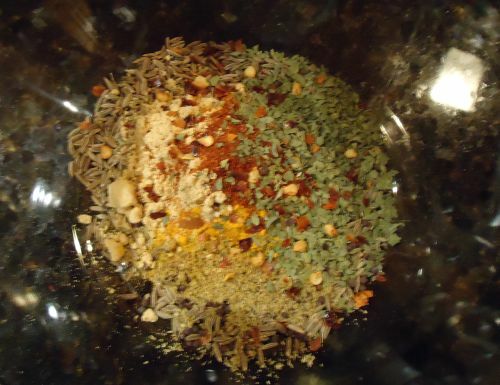 Once everything is mixed, taste again and adjust seasonings if necessary. Serve topped with freshly grated Parmesan cheese. My apologies for the lack of postings lately. It’s just that I haven’t cooked anything terribly inspired of late! The main culprit for this is the lasagna I made several days (a week?) ago. It was small, as lasagnas go–only 8×8. But I’m just one person. It takes a long time to eat an entire 8×8 lasagna. And while I had good intentions of freezing half of it, I realized that I had no good containers to freeze it in, and then I got busy and lazy, and pretty much just lived off of the lasagna til it was gone. Why didn’t I write a post about how to make this lasagna? Because everything you need to know is on the back of the Barilla lasagna noodle box. I told you! I got lazy! (And plus it was a good way to use up the pre-cooked ground beef that was left over in my freezer from a particularly unfortunate cooking debacle a while back). Anyways, I now have a fresh batch of groceries and grand intentions of cooking new and creative dishes, so be on the lookout for new posts coming soon! Time to Clean Out the Fridge. When I find myself in such a situation, I have two go-to options: veggie omelette* or stir fry. But since I didn’t have any eggs, stir fry it was! 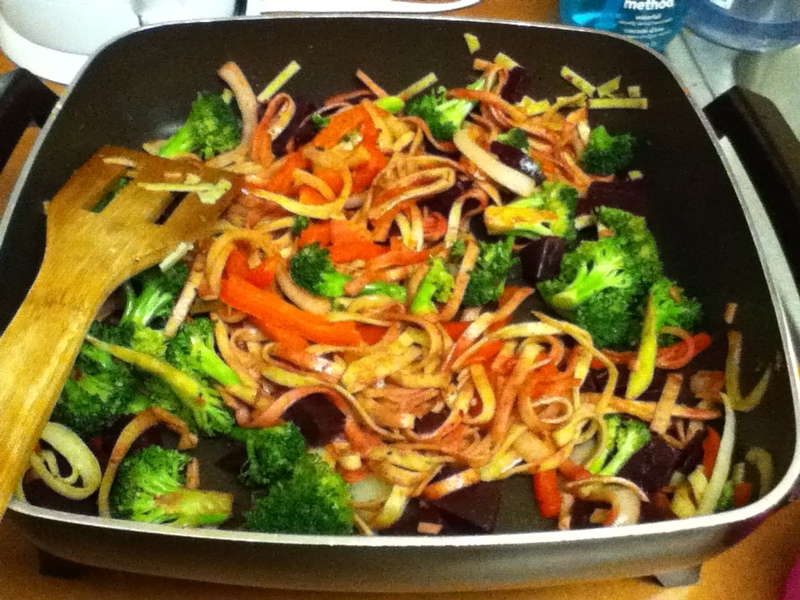 I had a random assortment of veggies on hand–half a red pepper, half an onion, a beet (the last of the beets! ), and some broccoli. This to me says Thai food. (Well, except the beet. But I needed to use it up.) But, of course, this being clean out the fridge day, I didn’t have all the ingredients to make any sort of authentic Thai food. 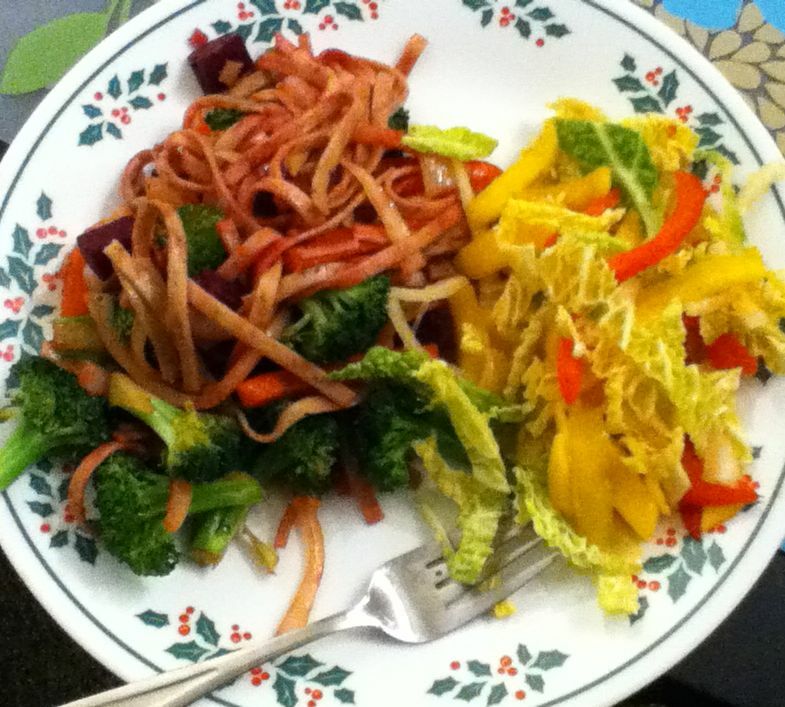 So I decided to just go with whatever seemed like it would taste good–veggies, spices, and long noodles. When I’m making up a stir fry with a lot of spices, I always like to get them out ahead of time so that I don’t forget any potentially good ones. 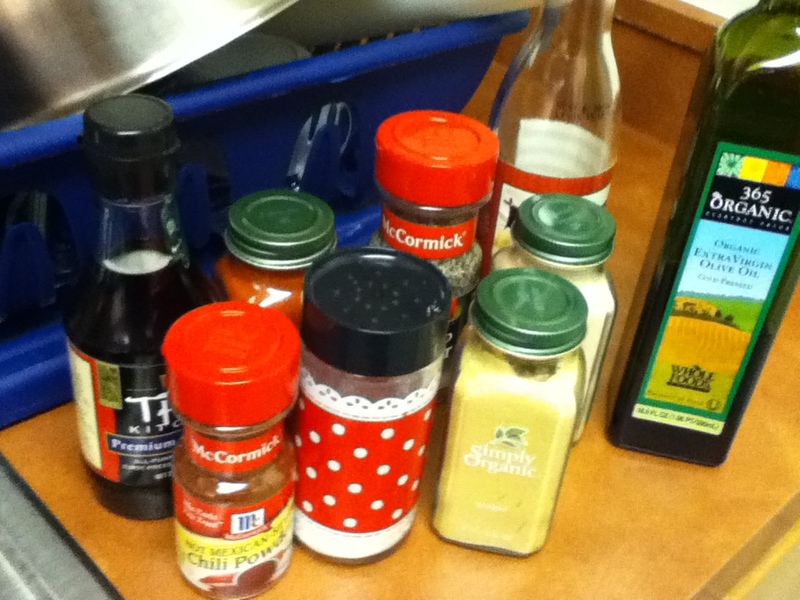 I pulled out ground ginger, garlic powder, chili powder, salt, black pepper, paprika, rice vinegar, fish sauce, and olive oil, figuring that I’d decide as I went along which ones I would actually use. I ended up not bothering with the paprika or garlic powder, or the vinegar (but more on that later. The biggest advantage of cooking in this is that it heats up instantaneously. Makes for speedier cooking! 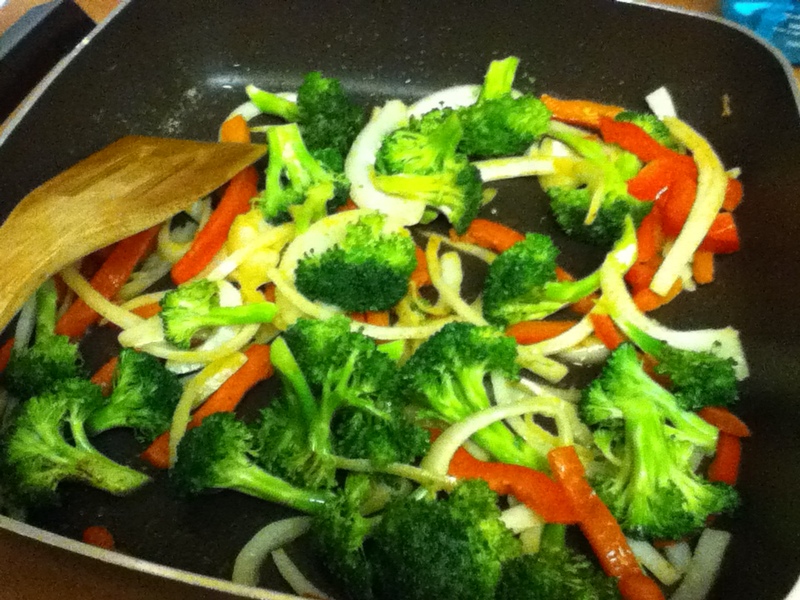 Once I had everything out and chopped, and water boiling on the stove for noodles, I put a couple glugs of olive oil in the griddle, turned it on, and let it heat up for a few seconds before tossing in the pepper, onion, and broccoli. After stirring things around a bit and getting a nice sizzle going it was time to start adding spices. I started off with the ginger, because I knew I was aiming for a gingery taste in the end. I had to put in a lot. If you’re making this at home, do it with fresh ginger if you can–the flavor will be much stronger! Then I added a little bit of salt (though not much because I was planning on adding fish sauce later and fish sauce is salty! ), some black pepper, and some chili powder, mixed everything around a bit more and tasted it. More chili powder and ginger! I really wanted this to have a kick to it. Once the broccoli was bright green and the peppers and onions were softening, I turned the heat almost all the way down just to keep it warm. You don’t want to overcook the vegetables! Once the pasta was done, I drained it, and dumped it in with the vegetables. The pasta I used came from Trader Joe’s and was a spinach and chive linguine. But really you could use whatever you want. I do like linguine for this type of stir fry though. I turned up the heat a bit, and after giving everything a good stir, I decided it was time to add some sauce. Now, I had no real plan for making this sauce. I vaguely intended to do something with fish sauce and vinegar. But I didn’t want to ruin the veggies. So I put a forkful into another bowl, dripped some fish sauce on it and tasted it. Wow is fish sauce ever fishy when there’s not a lot of other flavors mixed with it! (Yes, I know, this should have been obvious.) A little grossed out, I decided to add the vinegar to see what that would do to the flavor. So I added a few drops of vinegar to what was left in the bowl. Bad idea. Terrible idea, in fact. The vinegar idea was thus quickly vetoed. I decided, however, that a few drops of fish sauce in the entire stir fry wouldn’t be too overpowering, so I put some in. You could easily substitute soy sauce instead to make this vegetarian. And honestly? After the fishy smell/taste overload of the test bite…I might do that next time too. At this point you might be wondering what happened to the beet. Or you might have forgotten about it like I did. Granted I didn’t intend to put it in til the end anyways since all it needed to do was warm up, but I totally forgot about it until I was about to plate my food. But I tossed it in, turned up the heat again, stirred everything around, and then tasted it. I added a little more ginger, gave it one last good stir, turned off the heat, and plated up my food! 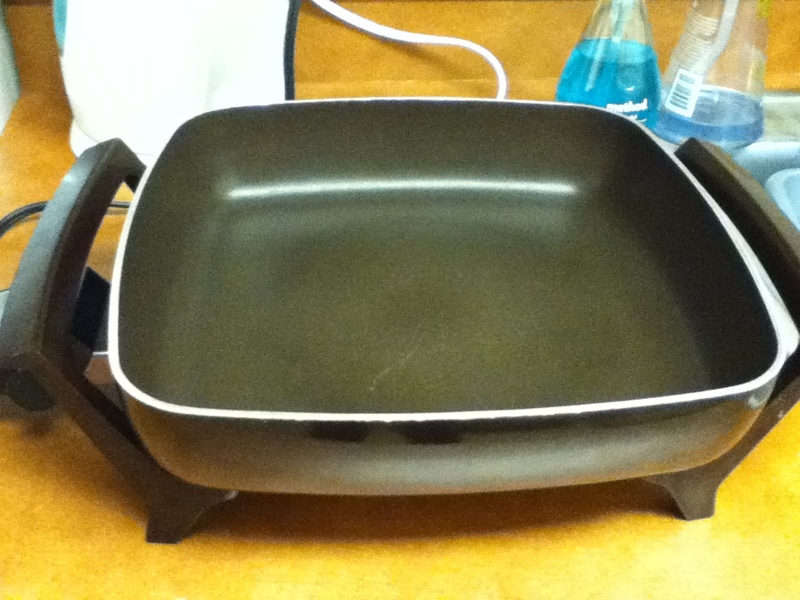 *Actually it very rarely turns into an omelette as I don’t have an appropriately sized frying pan. Usually it’s more like scrambled eggs with vegetables. **Smitten Kitchen’s mango slaw recipe.